City officials want to make people who rent out their homes on sites like Airbnb get one of two special permits. The city's own data, however, shows a resident can plan on waiting about a year to get either one permits. City officials want to make people who rent out spare rooms in their homes on sites like Airbnb get one of two special permits. The city’s own data, however, shows a resident can plan on waiting about a year to get one of those permits. Hosts who rent rooms in their homes on a short-term basis would need either a neighborhood use permit or a conditional use permit, depending on the neighborhood in which they live. Lots of other businesses already need to get those permits, which are required when someone wants to use property in a way that’s different than existing regulations. So things like auto shops, recycling yards, sidewalk cafes, veterinary clinics, museums, senior housing and others already have to get them. But getting one isn’t easy. In part, that’s by design. The process is meant to collect responses from neighbors, since the property is asking for an exception from existing regulations. Nonetheless, that makes it an uncertain process. Bob Vacchi, director of development services, last year said six months sounded like a reasonable estimate for a neighborhood use permit, though he acknowledged it was just a guess. Data from the city’s permit-tracking system shows that over the last 11 years, the median time to secure a neighborhood use permit was nearly 10 months — 284 days. Conditional use permits, which usually have a more involved process, took even longer. It typically took 398 days, or more than 13 months, to get one. 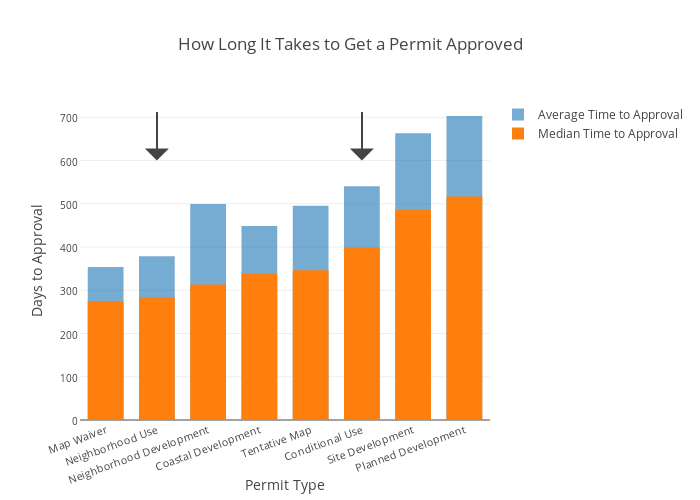 The graph below shows how long it takes to get any city permit that requires special permission, including the neighborhood use permits and conditional use permits relevant to Airbnb hosts. There are other permits that property owners can get much more quickly, because whatever’s proposed goes along with existing restrictions, and the city just needs to make sure a project meets health and safety regulations. Those aren’t pictured here. Not every permit request is created equal. For conditional use permits especially, the timeframe for approval can often come down to what’s being proposed, and how much neighborhood opposition it faces. He’s right. Appeals — where residents challenge the decision to grant one of the permits and force another hearing — can create some large outliers. Correction: An earlier version of this post included Airbnb hosts who rent out their entire homes as those needing permits. Only hosts who rent out rooms in their homes on a short-term basis need either a neighborhood use permit or a conditional use permit. Damon Crockett contributed data analysis to this story.